Become a Green Talent, promote your research in Germany and benefit from an exclusive network of excellent green researchers. Bonn – The goal of sustainable development is to find a balance between the need for socio-economic development and the need to preserve the environment, and to thus meet the requirements of present and future generations. The 2016 Green Talents competition will address the effects of climate change, pollution and overfishing on the earth’s biggest natural resources, the oceans, in line with the German Federal Ministry of Education and Research’s Science Year 2016/2017, which is devoted to the “Seas and Oceans”. These issues, as well as the challenges facing our environment in general, demand international research cooperation. 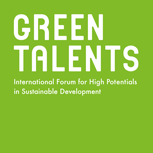 “Green Talents – International Forum for High Potentials in Sustainable Development” was called into life in 2009 by the German Federal Ministry of Education and Research to promote the international exchange of innovative green ideas from various fields of research. Every year, the Ministry honours 25 young researchers with the “Green Talents” award, under the patronage of Minister Johanna Wanka. Since its inception, the award has recognized 157 young researchers and scientists from 46 different countries for their outstanding achievements and contributions to making their communities, countries and societies more sustainable. The award-winners are selected by a jury of renowned German experts and are granted unique access to the country’s research elite. For more information please refer to the competition flyer on www.greentalents.de or watch the clip. Deadline for submission: 24 May 2016, 12 p.m. CET.